Businesses Sue Government Over Birth Control Mandate : Shots - Health News Religious groups were among the first to object to a requirement that employers' health plans provide free birth control. But some companies have also objected, saying the mandate violates their religious freedom, too. 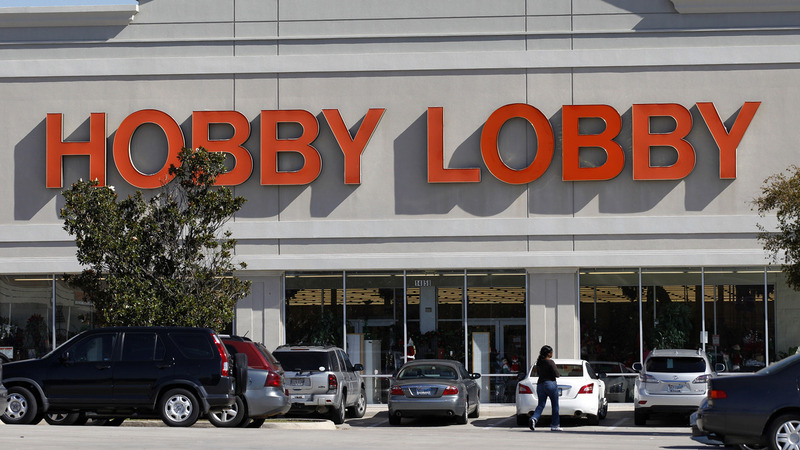 The Hobby Lobby chain of arts and crafts stores has gone to court to block a provision of the administration's health law that requires employers' health plans to pay for contraceptives. When Congress passed the Affordable Care Act in 2010, few would have predicted that one of the most contentious provisions would have to do with contraception. But today federal officials are grappling with more than 40 lawsuits claiming that the requirement for most health plans to provide contraceptive coverage to women violates their religious freedom. And religious groups aren't the only ones going to court. Religious entities — houses of worship and groups that employ only members of a single faith — are exempt from the so-called contraceptive mandate that requires birth control be made available to women free of charge to them. The administration has promised to find a compromise to address the complaints of nonprofit groups like Catholic hospitals and universities. As a result, the majority of lawsuits filed over the mandate are on hold, waiting for the administration to act, which is expected by the end of March. But what about businesses like Hobby Lobby, an arts and crafts chain with 500 stores in 41 states and more than 22,000 employees? "Hobby Lobby has always been a tool for the Lord's work," founder and CEO David Green told reporters on a conference call last fall. "For me and my family, charity equals ministry, which equals the gospel of Jesus Christ." Green said he has always run his company in accordance with his Christian faith. His stores aren't open on Sunday, and the company contributes time and money to Christian organizations both in the U.S. and overseas. But he said the contraceptive requirement directly challenges that faith. "Our family is now being forced to choose between following the laws of the land that we love or maintaining the religious beliefs that have made our business successful and have supported our family and thousands of our employees and their families," he said. In the months ahead, Green faces a choice: Comply with the mandate or pay as much as $1.3 million a day in fines. That's because courts — all the way up to the Supreme Court — denied him an injunction that would have delayed the requirement while his lawsuit works its way through the courts. Hobby Lobby is one of four companies that have sued but haven't been able to win a delay of the requirement. Ten other private lawsuits have been granted a temporary stay. But so far, only one of those cases, in Missouri, has resulted in a decision on the religious discrimination arguments. And, Brigitte Amiri of the American Civil Liberties Union points out, "The court in that case held that the case should be dismissed because the plaintiff could not show that its religious liberty would be violated by the rule." In the end, Amiri says she's "hopeful and optimistic" that backers of the contraceptive coverage requirement will prevail, at least in the case of the private companies that are suing. "Once you enter the public sphere, and particularly when you operate a for-profit company," she says, "you can't impose your religious beliefs on your employees." There is also plenty of court precedent, she says, to back that up. "The courts have routinely held that employers who have a religious objection, for example, to paying their female and male employees equally ... based on beliefs that the Bible says men should be head of household, they still have to comply with federal law that says you have to treat your male and female employees equally," she says. But Francis Manion, a senior counsel for the American Center for Law and Justice, who is representing three of the for-profit companies suing over the mandate, says he thinks they have a good chance to prevail. "What all of these entities are arguing is that the mandate is imposing a substantial burden on their religious exercise or beliefs," Manion says. "And that the government cannot show a compelling interest in pursuing this mandate against these entities." In other words, he says, the government might have other options to ensure that women get no-cost contraception. "For instance, we already have massive government programs that provide contraceptives for free," he says, referring to the Title X family planning program, which has itself been controversial over the years. Manion says one possibility would simply be to make that program universal, rather than limit it to people with low incomes. But that would likely raise the same fight that currently goes on over abortion — about whether people who object to something want their tax dollars used to pay for it. One thing those on both sides of the debate agree on — this is all likely to wind up before the Supreme Court, probably next year.